Go Sony go. Apart from making some of the best phones in the world, Sony wants to make games in Augumented Reality (AR). Games like Air Hockey. Recently the company demonstrated the Concept and it was extremely fun. 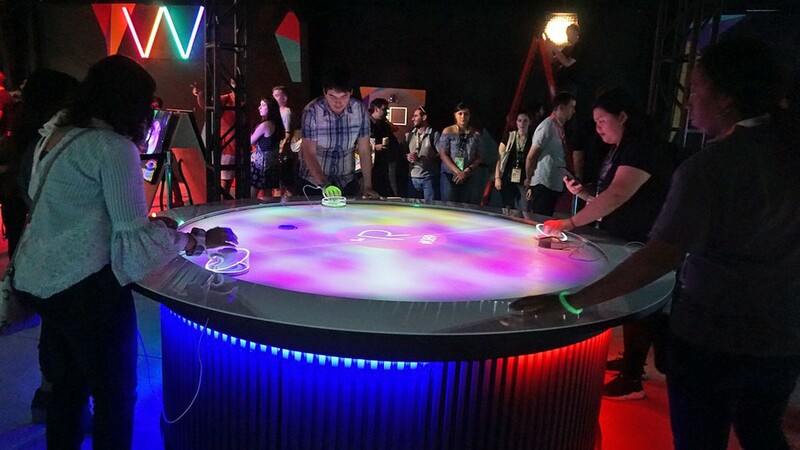 The project which is officially called "A(i)R Hockey," the concept combined Sony's light projection tech and haptic sensors to create a next-level air hockey game. The game, which supports up to four players at once, starts out with a regular air hockey puck that players bat around into each other's goals. Soon, virtual pucks are projected onto the table and added to the mix. The paddles are equipped with haptic sensors that vibrate each time you touch a puck. Of course, you don't get that satisfying *clack* of the puck rattling down into your opponent's goal like you do with the real thing, but the real puck adds enough sound effects. And the haptic sensors give just enough feedback to make you feel like you're actually hitting something when you strike one of the virtual pucks. Even more impressive is that Sony managed to pull this off with a low enough latency that there is no perceptible lag between when you hit the projected puck and how it moves. The virtual pucks behave as usual bounce around the table, just like a physical one. This is all possible thank to Sony's high-speed "vision sensor" that can track objects at up to 1,000 frames per second. All these is so cool. Thank God for Sony. All these just make us ask the question what more AR games can we expect for Sony.